I have been to the other Emmett's locations, so I decided to give this one a try. The beer selection was the same as the other locations. I was only planning to have lunch and a quick beer, so I went with the one that I knew I liked. The McCarthy Red was good as usual. My wife tried the seasonal which was a Beligian Wit. It had a nice citrus hint and the flavor went well with food. I have found that the "high end" entrees at the other locations have been disappointing to me, so I decided to keep it on the simpler side. The salmon sandwich was pretty good. It had a nice grilled flavor and the fish was still moist. My wife had the spinach and strawberry salad, which she said was good. 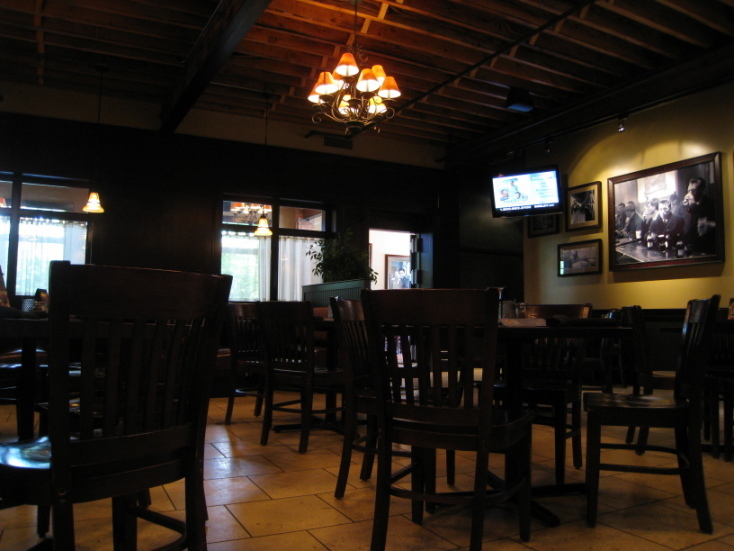 The atmosphere in this Emmett's was similar to the other locations with lots of dark wood. The number of TV's was less than obnoxious also. It was about noon on a Friday of the July 4th weekend, so the place was pretty dead. This made for a nice quiet dining experience for our visit, but I don't know what it would be like on a busy Saturday night. Overall this place is acceptable, but I am still underwhelmed by the beer selection. When considering the driving distance, I would have done better to go somewhere else. I've been to this Emmett's before, but it had been years. Emmett's has since picked up two additional locations in Palatine and West Dundee. Ryan Clooney is the brewmaster. You will find five standard beers on draft here, and one-to-three seasonals. The first beer I had (all were $5.00) was an English Mild [seasonal]. I will be earnest and tell you I didn't get much of anything from this beer. It was well-brewed; it looked good, and it was a full 16-ounce pour (Emmett's tells you *in print* that it uses 20-ounce glasses so as to ensure that you get 16-ounces of beer plus a one-inch head atop that.) and I drank it all; but I didn't like this. It was non-descript. I went on to the 1 A.M. Ale. This was better. It was dark amber. It had a balanced mouthfeel with hops gradually acceding to the malt. The next beer was _my favorite_: The Double Barrel Oatmeal Stout. This is ostensibly a GuinnessÂ® knock-off. But it is better than that. Guinness should taste like this. An opaque black color. It is dispensed with nitrogen to turbo-charge [if you will] the head. A coffee malt taste that goes on and on. My final beer was the one I think more of you will enjoy: The McCarthy Red Ale. This was a bright red. Hops in the aroma. Hops in the taste. Hops in the aftertaste. But not overbearingly hopped. If you don't want to drink Emmett's beers; there are two guest taps (Young's Double Chocolate and Spaten Premium), and Miller High Life. Light beers in bottles are available. - but if you intend to have that, you should instead go to the ersatz "Irish" bar [with pub decor imported from West Orange, NJ.] across the street. Emmett's is not a participant in the American Homebrewers' Association's "pub discount" program. But it has food and drink specials through the week. I checked the box for "Good for kids" because on Sunday, persons aged ten and younger accompanied by a parent eat for free off the children's menu. Transit options: Here's your chance, you dyed-in-the-wool Chicagoan. You should strive to get here during the weekend; when you can obtain the Metra Weekend Pass for $5. The route you want is the Burlington Northern Santa Fe line from Union Station to Aurora. (There is *another* brewpub at the terminus of this line in the roundhouse in Aurora.) The station is "Downers Grove - Main Street". It is two blocks south on the west side of the street. Other days, it will cost you $4.30 each way. Adopt the mindset that trains are on a two-hour headway. There are trains filling in some hours on Saturday, and even *one* train which departs Union Station at 5:25 pm on Saturday and runs express to Downers Grove (25 minutes). Returning to Chicago is at 4:45, 6:45, 8:45, & 11:45 pm. Iâ€™ve been a causal patron of Emmetâ€™s since they opened. 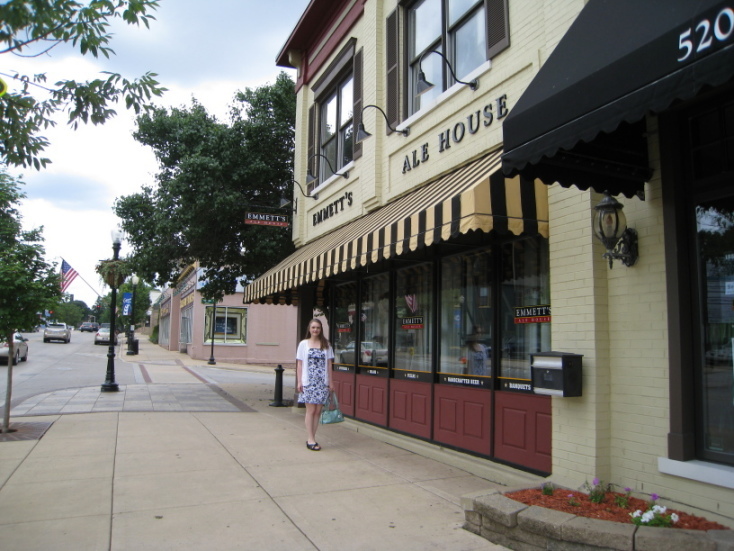 In fact, I even was here when this location hosted Founders Hill Brew Pub. Emmetâ€™s is an upgrade! The dinning room is to the right as you enter. Lots of tables, it is decorated in brown, creams & red. There are some fantastic old photos on the wall. Great to see all that brewing/bar history. They also have separate banquet rooms on the first floor. I guess they have even more room upstairs. The bar area is very nice. I would guess the bar itself seats about 25 and with all the tables, you can easily seat another 75 or so. I liked the layout and appreciated all the large screens. Itâ€™s a great place to catch a game & Iâ€™ve seen several alumni groups that use Emmetâ€™s as a meeting place. The food is very good if a bit on the expensive side. However, the portions are large, so I would say itâ€™s a decent value for the money. Iâ€™ve had and enjoyed the fish & chips, a tasty burger, wings, and a very nice grilled portabella appetizer. Service is decent and not intrusive. They will give samples if asked. I think their beers are well done and close to style. Iâ€™ve enjoyed a variety of stouts, English Ales, Reds & APAs. They also offer their take on Belgianâ€™s, dobblebocks & Seasonals. They offer some good guest taps, but seem to be deemphasizing that part of their beer offerings. They also have a fairly standard bottle offering for your non-adventuress friends. Added bonus, there is a nice Irish bar across the street ( The Ballydoyle) and downtown Downers Grove is a pretty bustling place. Well worth a stop! Emmett's is a good neighborhood brewpub. First the upsides. Solid food with some decent daily specials such as 1/2 price appetizers on monday (sadly the combo platter is not eligible), and wing and pitchers night. The beers are average to very good (see Victory Pale Ale as very good). My biggest complaint is the slow rotation of beers, probably due to brewing capacity as there is hardly ever more than one special and sometimes the one special sticks around for quite a while. Service is variable based on the server. If Emmett's would tighten up their service and offer a wider variety of their brews they could be exceptional. I'll start with the good. I suppose the most important thing here is that the beer is good. In the past I have had both a Dortmunder and a Scottish ale that were excellent. Their regular session beers are also up to par. Their food is excellent. If you want appetizers they have awesome pretzel bites with homemade dips, and if you want to stay for dinner it's very upscale for a pub, though it has prices to match. Now on to the bad... I get the feeling that management just isn't dedicated to the beer, which seems pretty backwards for a brewpub. I've been there on multiple occasions where they're out of multiple beers. If I'm there for lunch on a Saturday, I don't expect them to be out of my first THREE choices. Equally problematic is the staff's low beer IQ. The last time I was there I asked the bartender what kind of beer one of their seasonals was. She told me it's an ale. I asked what kind of ale, and she said, "um, pale ale?" I then asked about another beer and she gave me the same answer. After pressing her further she dug out a beer menu that identified the seasonal as an English bitter. When I explained that that was the information I was looking for, she informed me that she's never had that problem before and she's been bartending there for over a YEAR. And when I explained that all of their beers were ales (so she'd understand why I wanted to know more), she corrected me by noting that they also had a wheat beer. C'mon, management. I'm not asking that your staff know the difference between a North German Altbier and a Duesseldorf Altbier. I just expect them to know the basic varietals. Anyway, I may be a bit harsh here, but I do return from time to time because I have had some good beers there. I just wish the management would step things up a bit. Great beers with average service... I do prefer local brewpubs over the more "corporate, franchise or chain-style" brewpub businesses but I had to give Emmet's a try on my own. Sitting at the bar at this location I was asked what I would like and I asked for a beer menu. The beer menu offered about six or eight handmade craftbrews one of which was a seasonal (which you had to ask the server for details on). The seasonal when I came by was a dunkelweizen. I ordered the stout noticing that Emmit's served their stout with Nitrogen. The creamy head lasted longer than the beer in the glass and I had to order another. It took me some time to get some service but between a stout or two and Emmit's custom IPA, I left happy but still wanting more time or attention from the servers. The menu seemed chocked filled with tasty brewpub eats but I arrived past 11:00 pm and the kitechen was already closed. This location seems like it would be good for dinner with the family but not so great for getting loud with your pals. Maybe try Lunar Brewery for the later.